Louis Fryzlewicz (not pictured above) flew two missions as FE, then was grounded due to his MOS. Later he became Crew Chief of "Censored (Lady)". Thank you to Dave Paruti for notifying of us of his father's Final Flight. The family of 2nd Lt Soloman Pritt notified us that he has taken his Final Flight. Steve Garrison notified us of his great uncle Edgar Oaks having taken his Final Flight. Contact has been made with Soloman Pritt, Edgar Oaks and Joseph Paruti. Paruti confirmed that Cpl Milton Jacobs, their Tail Gunner, flew with Crew 16 on their 4 May 1945 mission in which 6 members of Crew 16 and Jacobs was lost. Jacobs was filling in as temporary Tail Gunner after Crew 16's TG T/Sgt James R. Ogilvie, shot himself in the leg when the .45 he was cleaning discharged. After Ogilvie recovered from his wound and was discharged from the hosptial - he flew as Replacement Crew 11's Tail Gunner. Added first name of S/Sgt Edgar Oaks to roster. He and his fellow crew members are listed on GO-5 dated July 19, 1945, Award of Air Medal; 10 members of this crew are listed on these orders - Cpl Milton Jacobs was not - however the American Battle Monument Commission's War Dead database does show he was awarded an Air Medal - which could be covered under a different order. Previously only Oaks' last name was known at the time the crew photo was added. Thanks to John Essig, CFC, P-10 for providing a copy of GO-5. Maurice Picheloup recalled this about the Handa Mission "this was a case of checking Flight Engineer performance and during the mission I helped in the cruise control where most of his trouble problems exisited. We had engine problems and had to land at Iwo Jima. 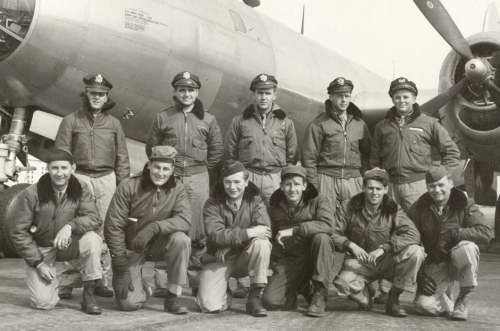 * The last names and positions of these airmen were provided by Dan Rich along with the crew photo. Rank and first names were obtained from searching General Orders 25 - Battle Participation Award (Bronze Service Star). These orders listed over 500 members of the 60th Bombardment Squadron. If you know any of the above information to be in error please contact updates@39th.org with the corrected info. Special Thanks to Dan Rich for providing the last names of this crew and to Elmo Huston, FE, P-7 for providing a copy of General Orders # 25 dated: 16 August 1945. Rich mentions that his uncle had mentioned that the crew made 2 or 3 PW Supply drops. No complete mission list is availabe at this time.